The author of this letter to a daily "national" newspaper doesn't get the point of the redress money the Ukrainian community is (still) seeking, despite the government's passing of Bill C-331. He lumps Ukrainian Canadians in with other ethnic groups demanding compensation ... which is just money for themselves, at the expense of today's taxpayer. 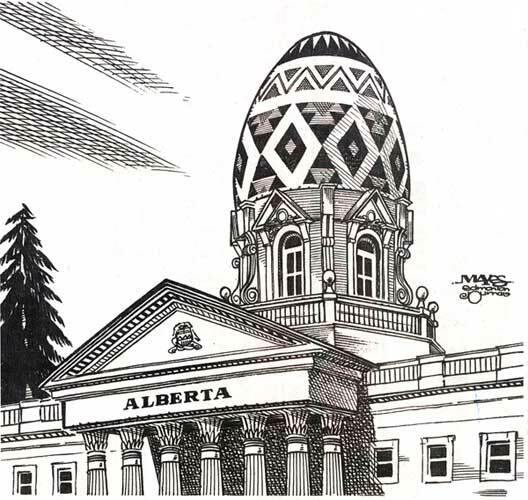 What UCCLA, on behalf of Ukrainian Canadians, has repeatedly asked for is not compensation, but simply the money that the government confiscated from Ukrainian and other East Europeans during the WWI internment operations, and never did return. Furthermore, that money is not destined to line the pockets of ethnically-defined individual Canadians, or even the descendents of internees, but rather for an educational campaign that will allow *all* Canadians, "hyphenated" or not, to learn about this particular episode of their own history ... something mainstream Canadian historians have oddly seemed loathe to do. Who knows, such a campaign might just enlighten those who arrived here within the last half-century as to why Canada is now such a great place to live. Canada is not some fairyland utopia. It is a country that people worked hard, and often suffered and sacrificed, to create ... so that those following in their footsteps would not have to work as hard, or suffer and sacrifice as much as they did. Sarcasm from those who don't appreciate the sacrifices of their predecessors does little to enlighten or enrich the fabric of Canadian society. Ukrainian radio audio archives for Dec 24 are now available for download and streaming on the website ... and for podcasters via this RSS feed. On Nash Holos, special Christmas Eve programming features lots of carols and greetings from near and far. Sylvia has an interesting twist on kutia and Fr. Bruce reminds us of the "reason for the season" with an exploration of the Nativity icon found in most Ukrainian churches. On Chetverta Khvylia, Pavlo brings you news and views, exclusively in Ukrainian, and also gets into some special Christmas Eve programming for those listeners celebrating according to the Gregorian calendar. Speaking of raising consciousness, Ukraine's female pop icon Ruslana is using her celebrity for a very good cause. A big "Brava" to her for putting out this video and raising awareness of the scourge of human trafficking. Human trafficking, especially for purposes of sexual exploitation, is one of the few remaining "taboo" topics in today's society. Perhaps that's because it so clearly illustrates the barbarity of contemporary society ... and the reality that despite being more liberal, we are not really as advanced a society as we may like to think. Cross-posted at The Natashas blog. One of my favourite groups from Ukraine, Mandry, has put out a fabulous video which you can view here. It's very appropos on the 2nd anniversary of the elections brought about by the Orange Revolution. This was one of the hits enjoyed by the revolutionaries in Kyiv as well as those of us observing from the other side of the world. H/T to Irena Bell of Ottawa's Ukrainian radio program. Ukrainian Prime Minister Viktor Yanukovych spoke at a CSIS forum in Washington, DC on Dec. 04, 2006. A transcript of his talk, as well as an audio file and a video file, are available on the CSIS website here. Nash Holos Dec 17 Ukrainian radio audio archives are now available for download and streaming on the website ... and for podcasters via this RSS feed. Sylvia has a recipe for traditional Ukrainian spiced honey cake, and Fr. Bruce offers some practical tips for holiday travellers closer to home as well as a listing of the Christmas services at Ukrainian churches in the Greater Vancouver area. As usual, another Proverb of the Week, items of interest to the local (and global) Ukrainian community and, of course... plenty of Great Ukrainian music! Alberta's new premier was just recently sworn in. 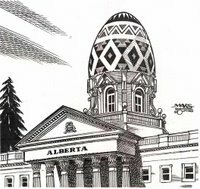 The Edmonton Sun published an article with great detail about his cold, and the Edmonton Journal published this charming cartoon. Might it be that the Canadian elite and the MSM just can't stand it that a Canadian of Ukrainian descent has become a premier? This is disappointing but, I suppose, not entirely surprising ... given the historical relationship between Poland and Ukraine. [According to the Organization of Ukrainians in Poland] ... the Polish TV channel TVP-3 has plans to take Ukrainian news off the air. Representatives of the channel claim there is no room for the Ukrainian program. ... this goes directly against Polish laws and international responsibilities in protecting rights of minority groups. .... It is estimated that there are nearly half a million ethnic Ukrainians living in Poland. Dr. Lubomyr Luciuk has written another brilliant editorial, published in today's National Post (here). It illustrates what can IMO be justifiably construed as the manifestation of an ongoing irrational prejudice against all things Ukrainian (and, probably, east European in general). They call it La Ferme -- The Farm, an innocuous name ... for an experimental farm. ... They were all prisoners under guard, dispatched into an archipelago of 24 Canadian concentration camps spread across the Dominion, from Banff to Beauport and beyond. They were also all civilians, not really Prisoners of War, just simple people branded "enemy aliens." Stripped of what little wealth they had, they were forced to work, for others' profits. ... When the internment operations ended on June 20, 1920, unpaid earnings of $9,510.17 were owed them, the equivalent of thousands of man-months of labour. Deposited with the Bank of Canada that booty still enriches their gaolers. Ottawa should acquire, restore and preserve the internees' cemetery. And if we honour the last Canadian veteran of the Great War with a state funeral, we should also so dignify the last internee when her time comes, recalling the innocence betrayed on the day this country carted children off into the woods --not because of anything they had done, but only because of who they were and where they had come from." Do send a letter to the National Post at this address, commenting on this article and deploring such apathy towards our country's history. Also, you might consider writing to your MP (find his/her address here) and insisting that the government honour its financial commitment to the Ukrainian community on redress. Smart Plate - just in time for holiday bingeing! Ok, I know this has nothing to do with Ukrainian music. But, food is a universal Ukrainian meme. And it looks like a Ukrainian has just invented a cure for gluttony. 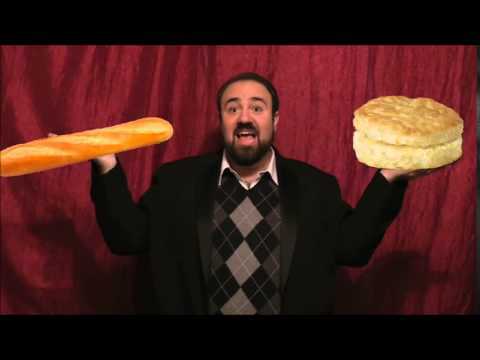 Well, I say, (recovering) gluttons of the world, unite ... and demand that it be made available! The National Radio Company of Ukraine has a brief report about President Yushchenko's recent meeting with the Ukrainian diaspora in Estonia. Wonder if he will make it to Canada sometime soon? This Kyiv Post article suggests some great, inexpensive Ukrainian eateries in Kyiv... This one in particular sounds like my kind of place! Puzata Khata’s chain of cafeteria-style restaurants is definitely the best of its kind in Kyiv. ... The chain also makes a noticeable effort to keep everything “Ukrainian”—staff members dress in traditional Ukrainian garb and only speak Ukrainian to customers (even if the customers are speaking Russian), and all the music played has Ukrainian lyrics. Most importantly- where else can you get a delicious three course meal, including a vinagret salad, borshch and meat-stuffed varenyky for Hr. 14.20? That's about CAD $3.40 ... pretty amazing price for a meal like that, and Ukrainian music too! Vancouver's Dec 10 Ukrainian radio audio archives are now available for download and streaming on the website ... and for podcasters via this RSS feed. Chetverta Khvylia archives are also up, so tune in for the latest in Ukrainian news and views, exclusively in Ukrainian, with host Pavlo Manugevych. On Nash Holos ... our veteran cooking instructor, Sylvia Pidraziuk Molnar, shares a recipe for traditional Ukrainian poppyseed roll. On Travel Tips, Fr. Bruce takes you through scenic Slovakia, in anticipation of Solaway Travel's upcoming summer tour to Eastern Europe. Join him on his spiritual segment, And With Your Spirit, for a brief biography of St. Nicholas the Wonderworker... the *real* man behind the Santa Claus myth. As usual, another Proverb of the Week, items of interest to the local (and global) Ukrainian community and, of course... plenty of Great Ukrainian music! Our CD of the Week is "Ukrainian Rhapsody" featuring virtuoso fiddler Yogi Klos. Enjoy! Here's Ukraine's entry in the Junior Eurovision contest. Unbelievable talent ... and what a cute kid! Check this out for some wickedly funny satire ... it may put you in mind of that song about the long-ago poisoning of Rasputin. ... You will never look upon the statement "Let's Do Lunch" the same way ever again. Song/video here, satire here. Enjoy! CBC just announced that the Holodomor is to be discussed on the CBC Radio's "The Current" on Thursday morning December 7th 2006. They are going to discuss the recent passing of the Genocide legislation and whether it was far enough. Vancouver's Dec 3 Ukrainian radio audio archives are now available for download and streaming on the website ... and for podcast subscribers there's now an RSS feed for Nash Holos! On Nash Holos ... our veteran cooking instructor, Sylvia Pidraziuk Molnar, has the scoop on honey and a recipe for honey cookies. On Travel Tips, Fr. Bruce takes you to Prague, another stop on Solaway Travel's upcoming summer tour to Eastern Europe. On his spiritual segment, And With Your Spirit, he explains everything you ever wanted to know about why Ukrainians have two calendars and two Christmases! As usual, another Proverb of the Week, items of interest to the local (and global) Ukrainian community and, of course... plenty of Great Ukrainian music! Our CD of the Week is "Learning Curves - The Students of Steven Chwok" ... a very talented group of tsymbala players. According to this article, a free software program has been launched that collects, organizes and stores tunes based on your personal tastes, and helps you share them. Goombah is a free service that helps you find new music and people who share your musical taste whether you're into blues, alternative, classic rock or any mix at all. Based on your iTunes collection and listening behavior, Goombah displays like-minded members' collections and recommends tracks they really like that you don't have. You can show your friends your music collection, and explore matching members' and friends' collections. It will be an uphill struggle for some time yet to revive the Ukrainian language in Ukraine. Still, it's encouraging to see such concerted efforts in Ukraine. This month, Ukrainians had another chance to take part in an unusual contest -- the sixth nationwide dictation intended to test their knowledge of the Ukrainian language. As in previous years, it was broadcast on radio and participants were invited to send their transcriptions to the radio's office. Those who were able to successfully avoid all the spelling pitfalls were rewarded with prizes. ... The dictation takes place every year on November 9 to mark Ukraine's annual Language Day. ... The nationwide dictation is part of effort forge a national identity and to bridge the language gap that emerged after the Soviet collapse. Its title -- 'Dictation Of National Unity' -- could hardly be more explicit. But the contest's impact so far has been modest, laments Mykhaylo Slaboshpytsky, the director of the League of Ukrainian Patrons -- one of the groups organizing the event. The World Association of Newspapers recently honoured the jailed Chinese reporter who blew the whistle on yahoo operations in China by awarding him its annual press freedom award. Ukraine just recently joined this group so perhaps, with time, it will. The Associated Press, the Middle East Publishers Association, the Editors and Publishers Association of Mauritius and the Association of Independent Regional Publishers of Ukraine have joined the World Association of Newspapers, which groups 76 publishers associations and 18,000 newspapers world-wide. Not suprisingly, Ukraine is a shining light in the FSU regarding press freedom. Ukraine has been so with any kind of freedom for centuries. Let's hope that, for once, that light doesn't get snuffed out. The region covering the former Soviet Union and Eastern Europe is one of stark contrasts when it comes to the state of press freedom. Countries such as Ukraine and those in Eastern Europe have shown steady progress in the fifteen years since the collapse of the Soviet Union. Press freedom in Belarus and the Central Asian countries of Kazakhstan, Turkmenistan and Uzbekistan has declined considerably in recent years, and the past few months have proved no different. Russia is characterized by a complex and often contradictory media environment.